Greetings fellow renovators. I hope everyone’s summer was fun and fruitful – whether you were tackling a renovation project or your summer reading list. For me it’s been inside time this year – with most of my focus on the woman cave shenanigans. Over the weekend I finally got around to fixing the hole to the left of the staircase. My wife loves her coffee – me? I’m 62 and I have never had a cup of coffee – or a beer for that matter. I’m weird like that. She wanted a place to have a hot pot of coffee or tea for her visitors – so that’s why the hole is there. So after I paneled the hole with some 1/2″ plywood it’s time to figure out what to do. So I hopped over to the home center and picked up this subway mosaic tile from Lowe’s. I added a electrical outlet on a GFCI circuit for the coffee pot. 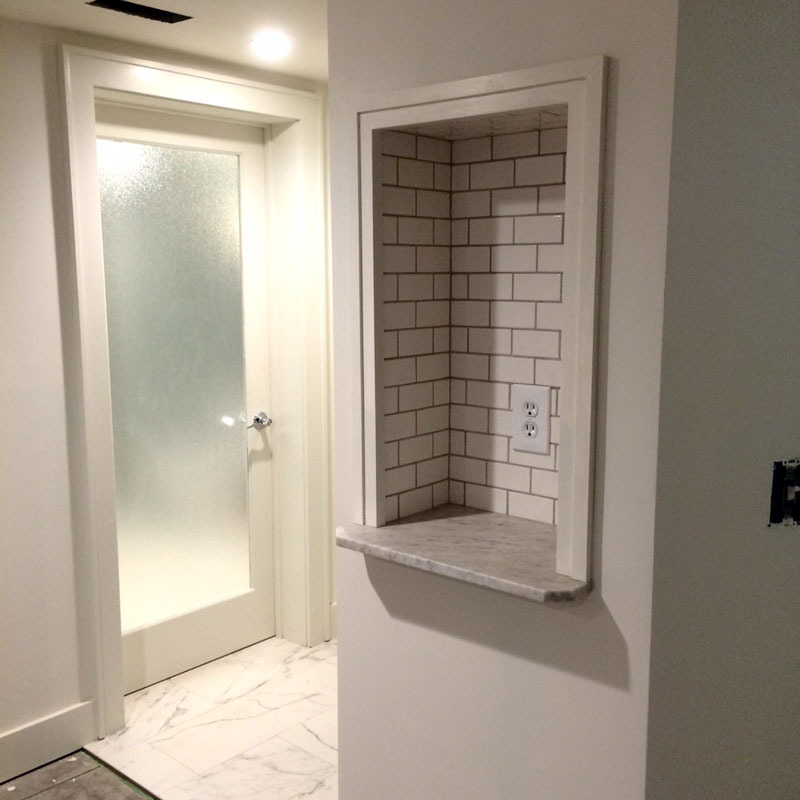 Since this is a house built in 1935 I thought this smaller version of subway tile would work. 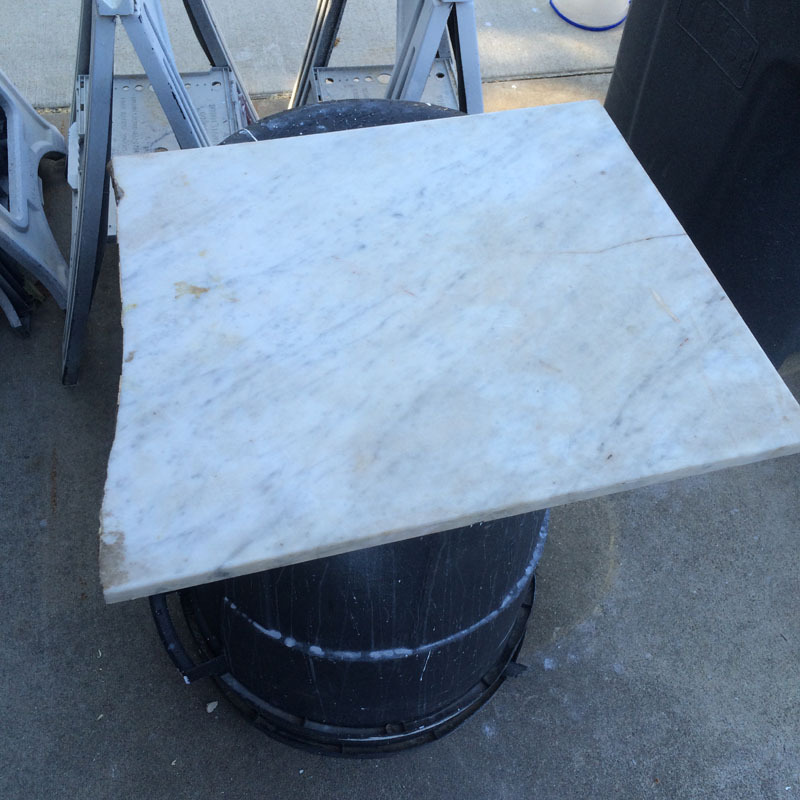 Next out to the garage to get a piece of antique marble top that my neighbor gave me – it was from an old dresser that had a top that split in two. After a little fiddling with the tile saw and a quick polish it was attached to the bottom with some silicone. 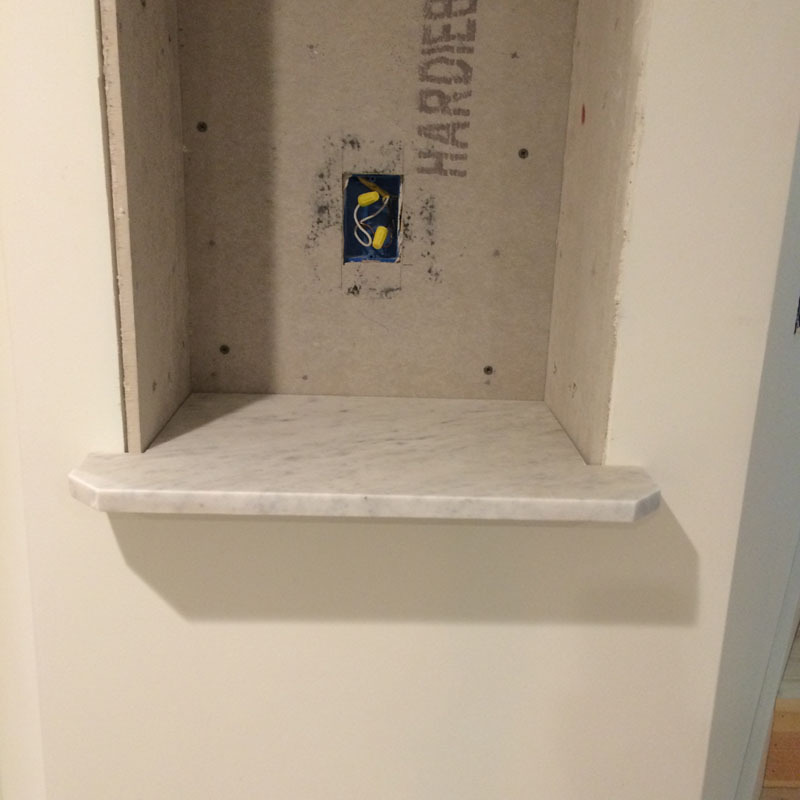 1/2″ Hardie cement board was added to the back, top and sides of the opening with a little tile adhesive and screwed temporarily until the mastic set. After a little math we start to tile. 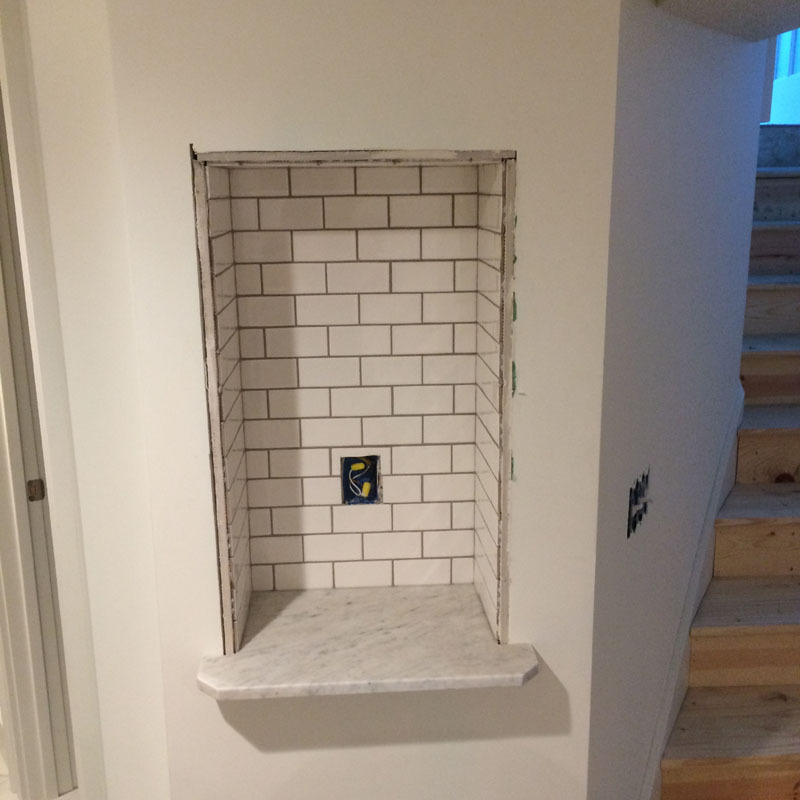 I used tile mastic instead of thinset here. Mastic is an organic adhesive that can’t take continuous water exposure. Since this area will only get a minimal amount of moisture it will work fine. 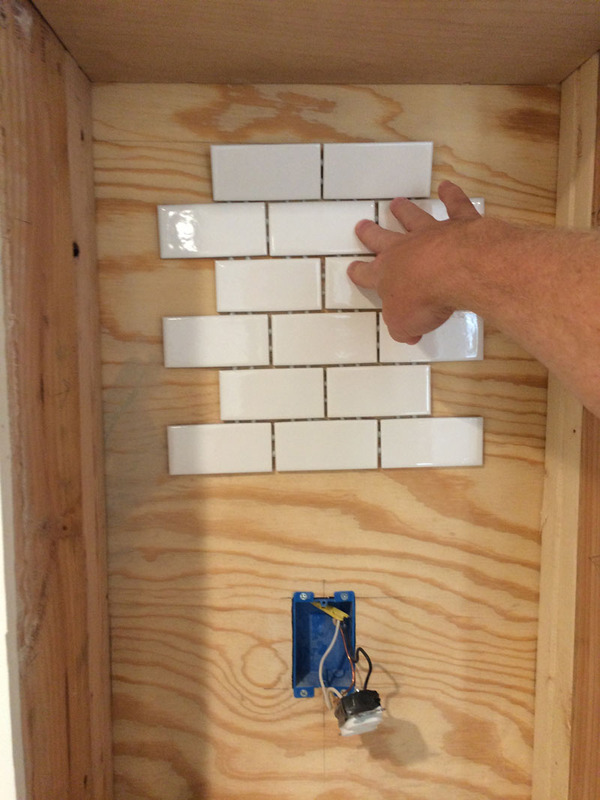 Mastic works well with mosaics because it holds tile initially much better than thinset. 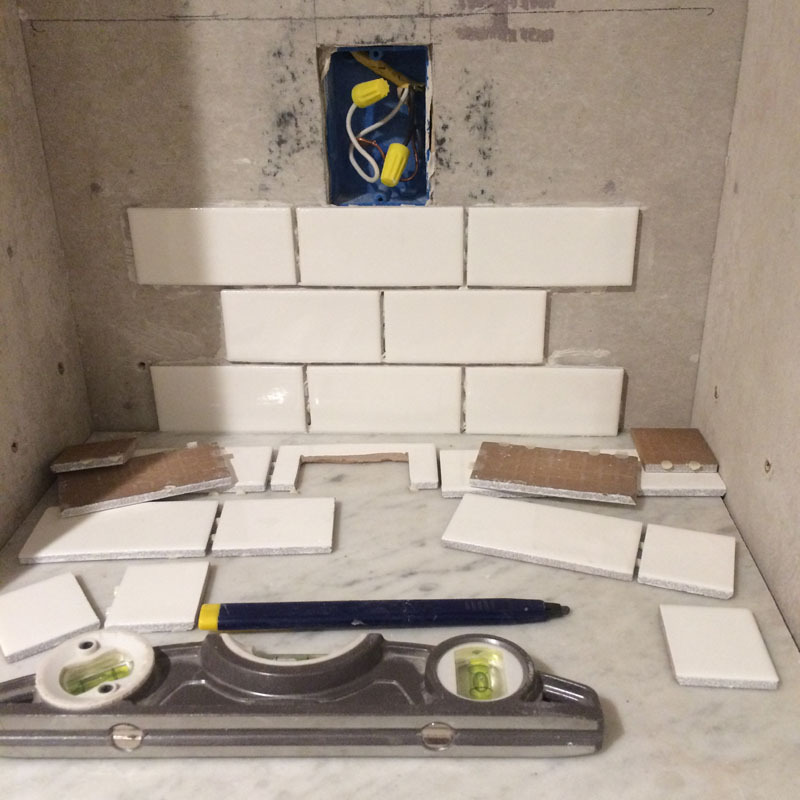 So in a couple of hours I’ve got the tiles set. The next day time for grout. I was kind of concerned because my wife picked a light grout and this looked way darker than the color sample showed. As it dries it lightens up – so that’s a good thing. 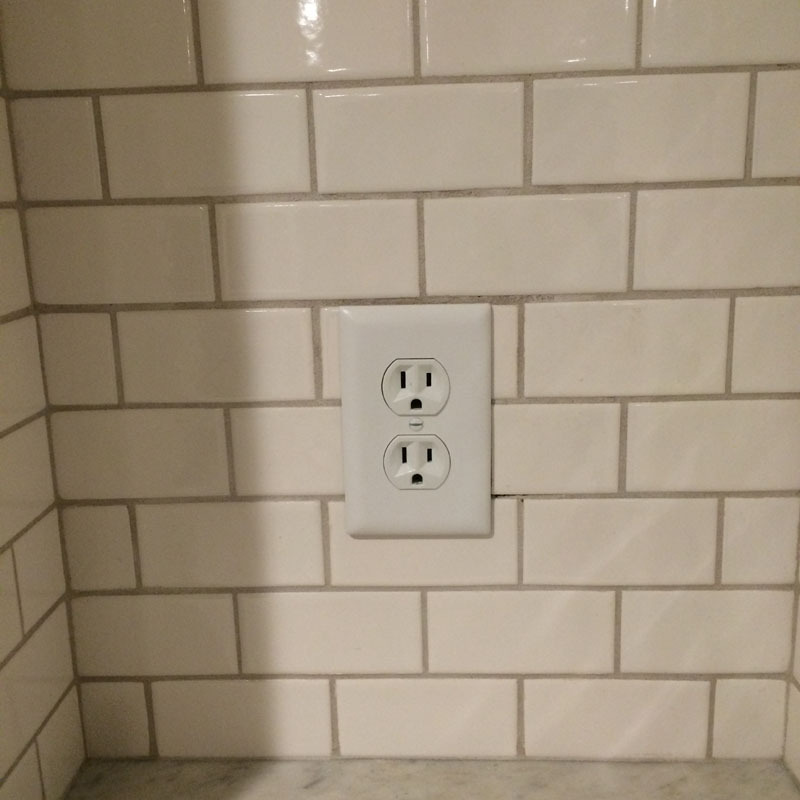 What’s not a good thing is I missed a little grout by the outlet plate. A little grout mixed up and applied will fix this. Then a little PVC trim is cut to cover the raw edges of the opening. This was milled from 5/4 (1″) stock to wrap around the front to cover the tile edge. After the cover trim is attached I made a back band trim to match all the other door openings. 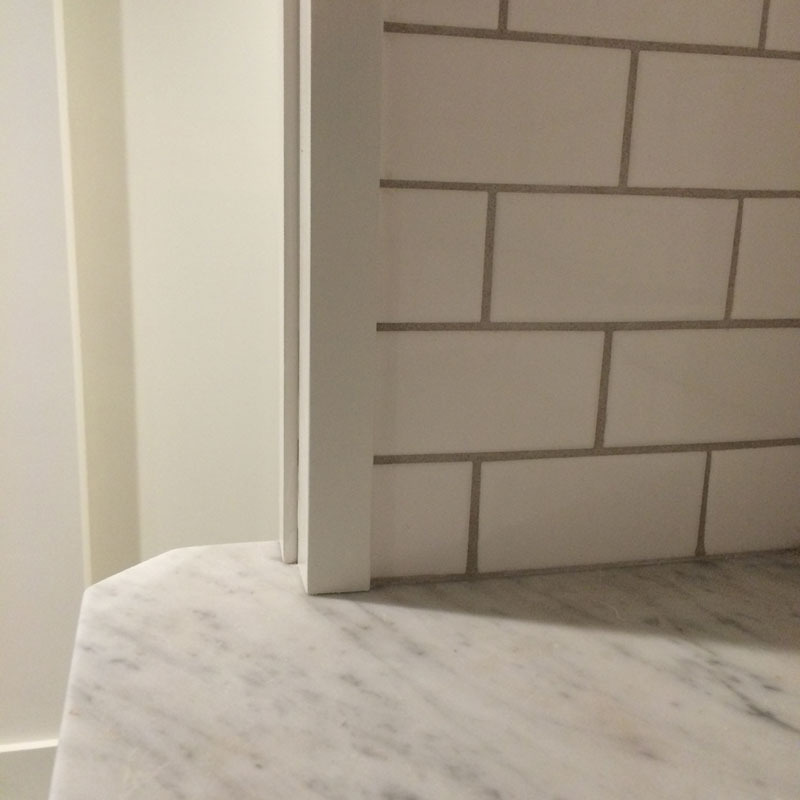 Here you see the trim detail that wraps around the front to cover the raw tile edge. Now all that is needed is the coffee or tea. If it makes my wife happy – then I’m happy. Onward we march – tag along, something pretty might show up. 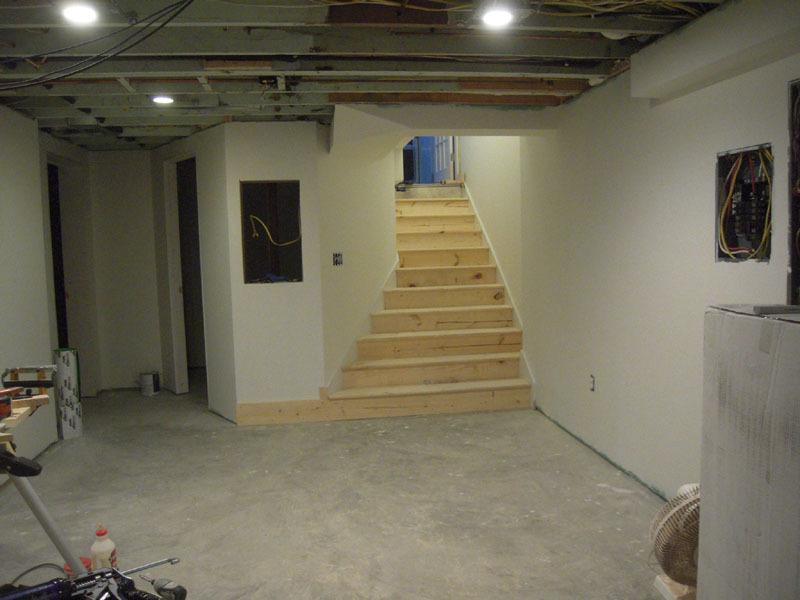 Now that the staircase is finished enough to make it easy to get up and down the stairs, we can now lug more drywall to the basement with ease. I’m using mold and moisture resistant drywall down here. Not sure why, because the humidity level in the basement is no different that the rest of the house. I’m using 4X8 sheets for the walls – that’s because that’s the largest size I can handle by myself. 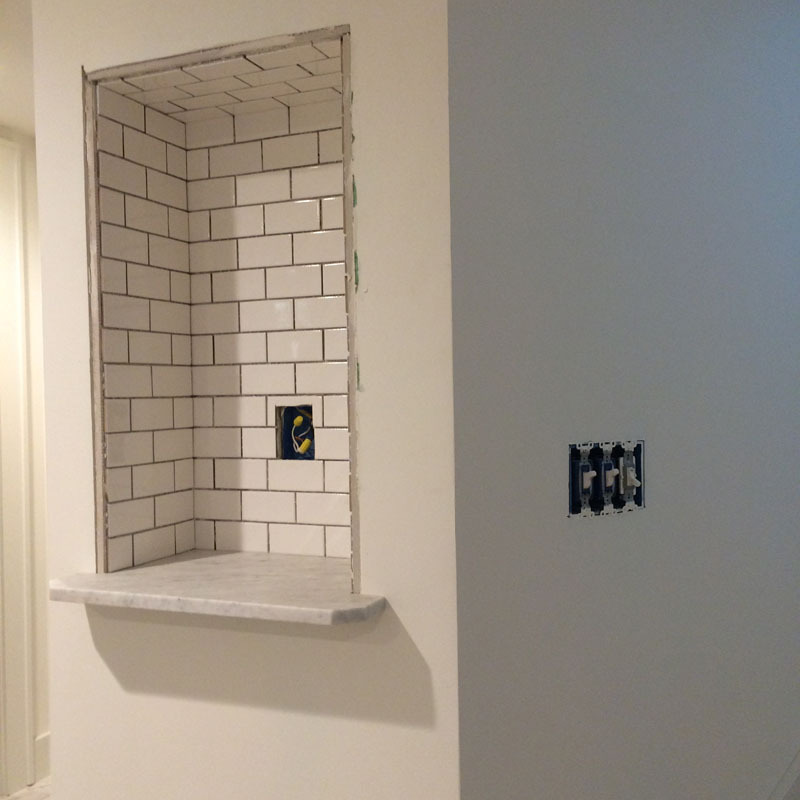 I had to make one more bulkhead by the electrical boxes to hide plumbing. 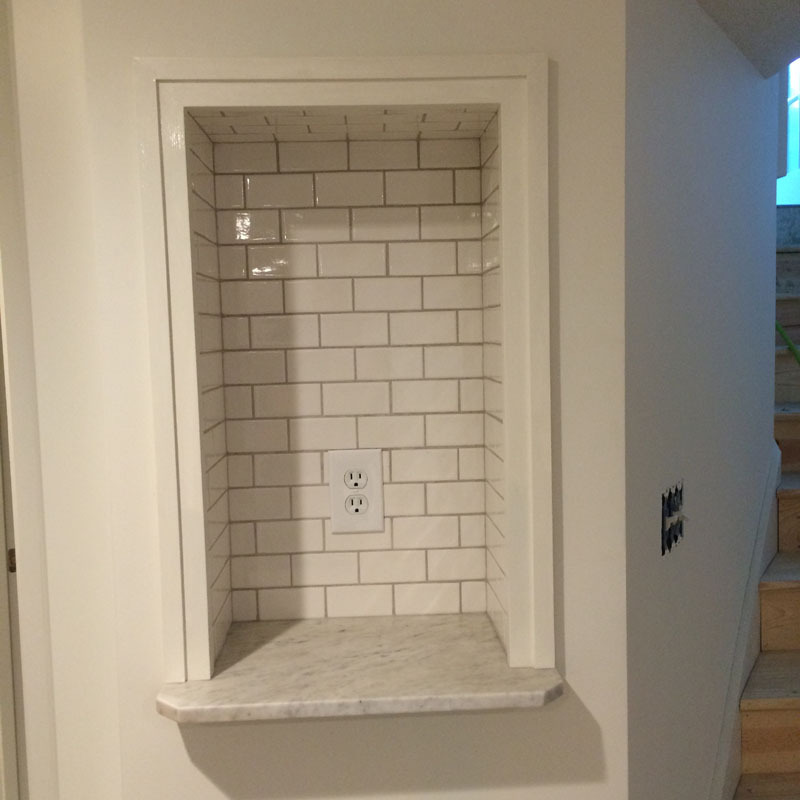 I’ll figure out something to hide the breaker boxes. Then continue along the walls and into the mechanical room and my little workshop. (I still have the 4 car garage to play in…so far). That mess of cat5e and coax cables are a job when my sawdust making period is over. I use a raking light to check for drywall divots before the primer goes on. Then the first coat of paint goes on – it’s BM Moonlight White – I think. The ceilings are being done by a drywall guy I know. 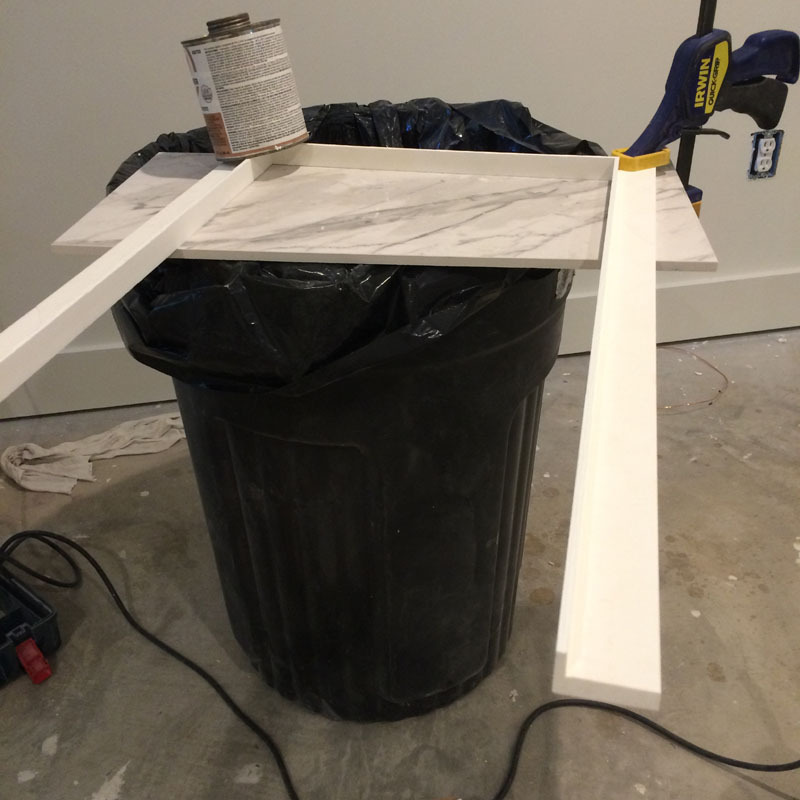 They use 12′ sheets – it will save my back and will look better than I could do. While I wait for the ceiling guy, I’ll finish up the framing for the whirlpool tub. And the framing and Kerdi Board prep is done for the steam shower. See? Some things are looking finished – well, if you don’t look up, that is. Pay attention now, I’m sure something pretty will pop up sooner or later.